Watch full Attack on Titan Season 2 Episode 4 English Dubbed full HD online. Attack on Titan Episode 29 English Dubbed online for free in HD. Two hours before the attack by the Titans at Castle Utgard, the 104th Trainees rest as their seniors keep watch. Connie mentions the Titan he encountered at his village resembled his mother, but Ymir plays it off. Reiner becomes suspicious when Ymir is able to read the unknown language on a food can. The Titans soon appear, and Nanaba and the Senior Scouts hold them off from the outside while Connie, Reiner, Bertoldt, Ymir and Krista defend themselves against smaller Titans that have breached the castle. 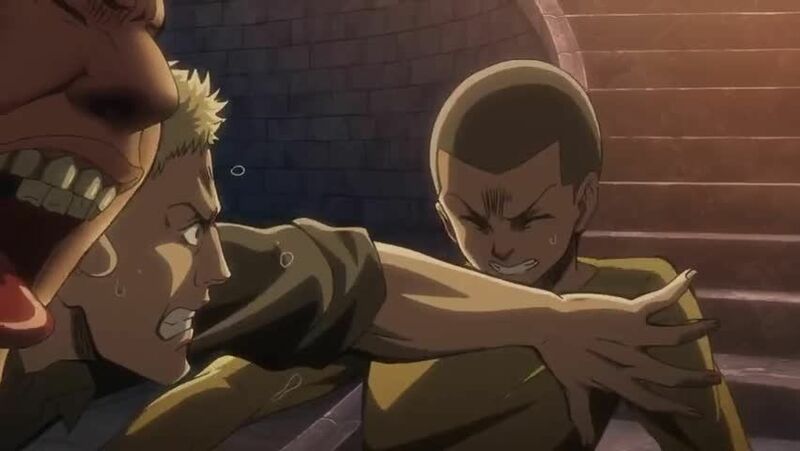 In the process, Reiner has his arm badly injured after it is bitten by a Titan. After clearing the area of Titans, the Beast Titan throws chunks of Wall Rose at the castle, killing the group’s horses. A second wave of Titans subsequently attack the castle, and the senior soldiers are soon overwhelmed and killed. As the Titans surround the tower the unarmed Trainees are on, Ymir, in order to save Krista’s life and honor the promise they made, jumps off the tower, and transforms into a Titan.